Review: Has Panic! At The Disco Changed for the Worse? • Tips, Trends & News in 60 Seconds or Less! Review: Has Panic! At The Disco Changed for the Worse? Ever since Panic! At The Disco has become only the mind of Brendon Urie, a debate has been going around between diehard fans of the group and music critics everywhere. The question at hand, of course, is has Panic! At The Disco changed for the better or for the worse? Now, we all know that in the music industry, artists have to do what is necessary to not only stay relevant, but also to change their artistic vision to accommodate their new callings. However, there is definitely a difference between growing as an artist and making music for the money. This album truly changed the course of emo music forever. Simply put, it is an iconic record with recognizable songs and mature lyricism that isn’t expected from a group of high school boys. As the years went by, Panic! At The Disco lost and gained members and changed the style of its music. 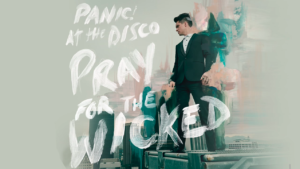 Now, in 2019, the style of music from its newest, Pray for the Wicked, definitely differs from its old one in a myriad of ways. Is it fair to call its new work bad compared to the old? Personally, I enjoy the old music more than the new. The new music that’s only created by Brendon Urie doesn’t seem as genuine as it used to. The fans that have an idée fixe with Urie and everything that happens in his private life only proves it. It’s not about the music anymore; it’s about him. This doesn’t mean I hate Panic! At The Disco, but it’s sort of bittersweet if you think about it. Yes, as an artist, Urie has become bigger but is losing everything you once had worth all this new-found glory?